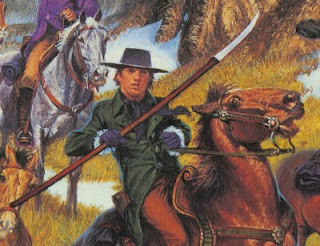 The worlds of Star Wars and Wheel of Time don't have a lot in common. They're both fictional universes (one's a fantasy series, the other takes place in space) and share some character archetypes, and they both have a central source of power or magic. Star Wars has the Force, Wheel of Time has the One Power. The Force is used by the Jedi, and the One Power is wielded by Aes Sedai and eventually, Asha'man (the male users of the One Power). The One Power and the Force are very much alike. They're both sort of out there to be grabbed and channeled by those possessing the right genes... or midi-chlorians. Both have a Light side and the Dark side. 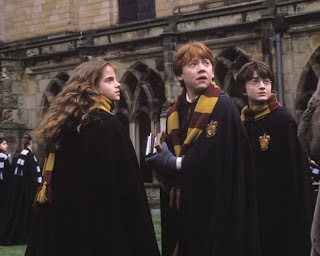 They each have ruling councils and training programs. The path to becoming a Jedi starts with being a Youngling; the Aes Sedai training starts with being a novice. The Jedi have the temple on Coruscant, the Aes Sedai have the White Tower in Tar Valon. A member of the Black Ajah using the One Power is just as terrifying as a Sith using the Force. 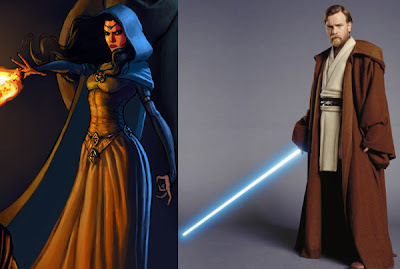 Given the similarities, it begs the question: would you rather be an Aes Sedai or a Jedi? Aes Sedai have much cooler outfits (the Asha'man have a uniform, so we're ignoring them for this argument). They can choose an Ajah depending on their strengths. They do have to like the color of the Ajah though since it's common practice to dress in the color of your chosen division. Attachments aren't forbidden, and it's not uncommon for the Green Ajah to take husbands. 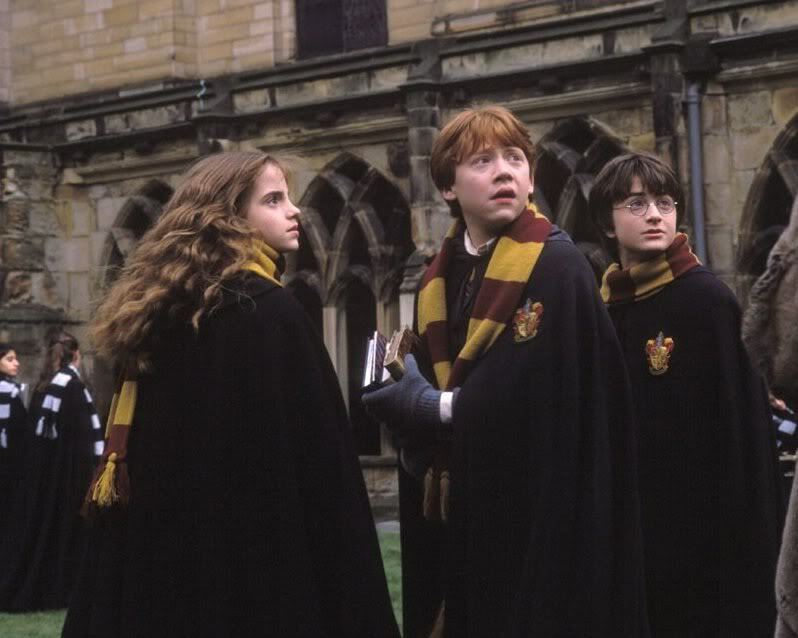 They get rings and shawls and have the freedom to travel. The use of saidar (the female side of the One Power) gives them a quality of agelessness. They still age, but their appearance doesn't show it. They can use the One Power to make themselves impervious to feeling heat or cold. Imagine never sweating. It's a beautiful thing. But Jedi have lightsabers, and that alone counts for a lot. I'd rather have a weapon at my side just in case something goes wrong. The politics within the Jedi order are nowhere near as deep as they are within the halls of the White Tower. The Jedi don't struggle for power the way the Aes Sedai do. I'll admit it could have something to do with the fact that the Aes Sedai are all women. Emphasis on could. The Jedi can influence the weak-minded, and ultimately, I think the Force is more powerful. It's less like magic. The Jedi are more selfless. They serve the ultimate good of the galaxy, or at least they strive to. I never feel like they're trying to rule the galaxy or even manipulate it. The Aes Sedai are masters at twisting truths (Obi-Wan would fit right in). I cheat. I own three lightsabers and a Great Serpent ring. Once Upon a Time: 7:15 A.M. review - True love, kissing, and dwarfs. Not in that order. It's Dangerous to Date Matt Murdock - One of the most risky spots in Hell's Kitchen is holding Matt Murdock's hand. Read through of his list of girlfriends and pay particular attention to how many of them are still alive. Mark Waid video interview - I talk with Mark Waid at length about Matt Murdock and Daredevil; learn what's ahead for the horned superhero. Also, check out all of Waid's awesome toys in the background. No Such Thing As Too Many T-Shirts - Have a t-shirt buying addiction? So do I. In this article, I just enable you by providing links to crafty projects and of course to cheap shirt of the day sites. A Visit to Rancho Obi-Wan, The World's Largest Private Star Wars Collection - I recently went to the happiest place on earth... aka Rancho Obi-Wan. Every bizarre Star Wars collectible you can imagine and lots more you can't. Check out the tale of my day and tons of pictures. 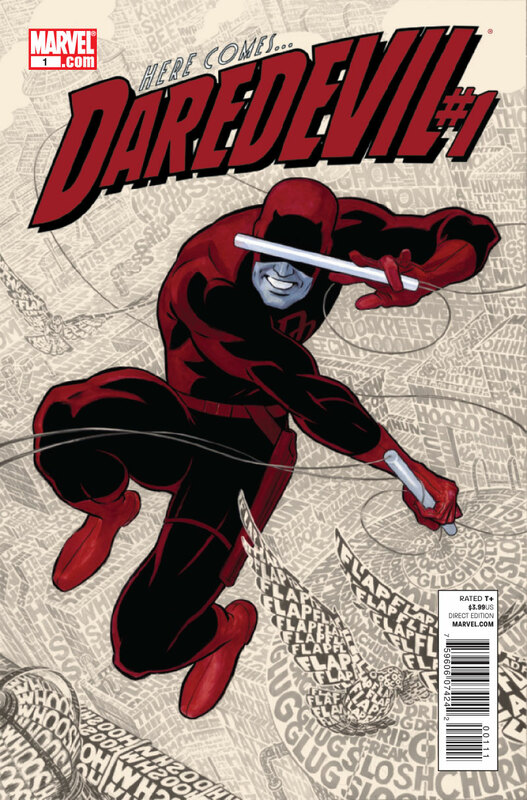 Dareamy - me as Daredevil as drawn by Thom Zahler. 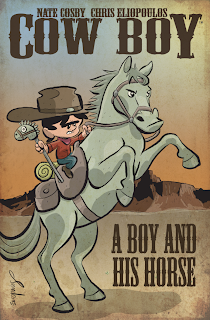 Remember when I said Cow Boy: A Boy and His Horse was the bee's knees? It's a story that just grabbed hold of me, and now, everyone can read it! It's being posted bit by bit online for free. Yep, you can read this awesome, all ages tale for nuthin. And when you end up loving it, you can pre-order the hardcover from Amazon or from your local comic book shop. 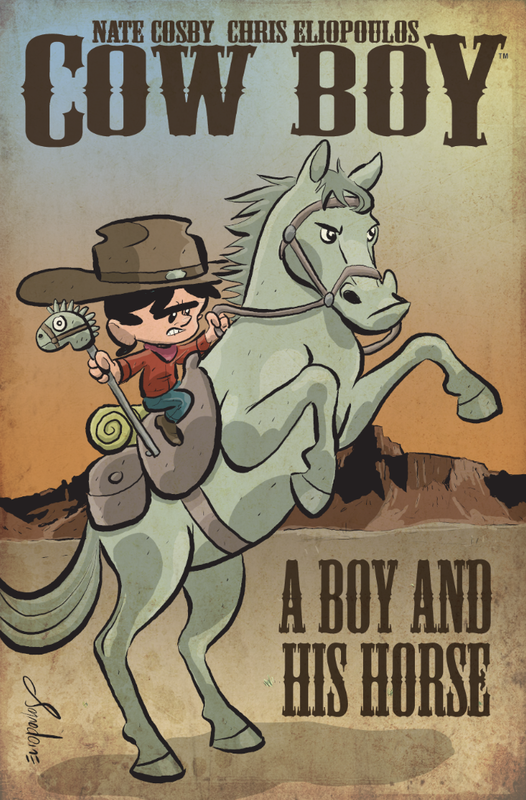 Go read Cow Boy now. As you may know, Mark Waid has been writing the most recent run of Daredevil. The buzz about the run has been overwhelmingly positive. Daredevil ended up on more than a few "best of 2011" lists. Since it is Daredevil month at Blastoff Comics, I sat down with Waid to talk about his current run on Daredevil and about the hero and Matt Murdock in general. We also discuss what Matt will be facing in the months to come. Check out the interview at Blastoff Comics. If nothing else, be sure to click over just to watch for a minute to see all of Mark's cool toys in the background. 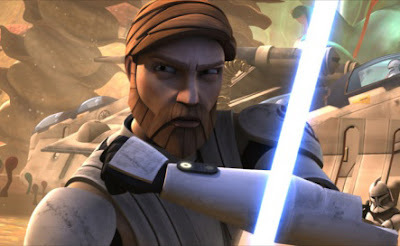 After a severe lack of Obi-Wan so far in this season of Star Wars: The Clone Wars, we finally got a hefty dose of the Jedi knight in last Friday's episode (Deception). 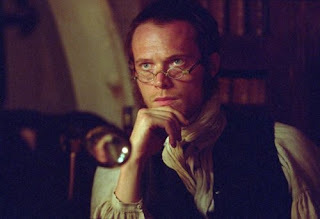 Obi-Wan went undercover to halt a plan to assassinate Chancellor Palpatine (oh, if they only knew). He assumed the identity of a bounty hunter headed for prison. While there he runs into some familiar faces that fans of the Clone Wars will be happy to see. It was an action-packed, shoot 'em up sort of episode and one in which James Arnold Taylor's voice talents really shined. Something in particular caught my attention though. 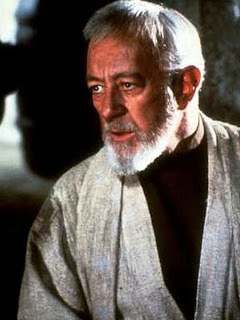 When Obi-Wan called the Jedi Council to check in with his latest report, he referred to himself as Ben. Of course Ben is the name he used while in hiding on Tatooine. Nevermind that he forgot to alter his rather memorable last name. When Threepio mentioned the name, Luke connected Obi-Wan Kenobi to Ben Kenobi in about a second. Anyways. We've never heard Obi-Wan refer to himself by this name before. Not in the prequels, and Pablo Hidalgo confirmed we haven't heard it on the Clone Wars yet either. The source of his chosen alias hasn't been identified. It could be entirely random. I mean, if I were to choose an alternate identity for secrecy, I'd go with something like Zelda for no other reason besides the fact that it sounds cool (or maybe something more subtle). Does this first instance of him calling himself Ben mean it's the first time he used it? Not necessarily. It's just the first time we're hearing it. I think maybe the transmission reveals this was his preferred name to use whenever he went undercover throughout the Clone Wars and then later on Tatooine. What do you guys think? Once Upon a Time: True North review - Not my favorite episode of the series, but Emma Caulfield was great as the Blind Witch. Daredevil vs. Matt Murdock - The man vs the superhero and who I like better. Sadly, GeekChicLA is no longer. It's probably for the best though since I was just finding 5,000 more things in this city I need to do. As I recently mentioned, I've started contributing to a site called Blastoff Comics, and I'm pretty excited about it. Blastoff Comics is a lot of things. It's an online store, it's a blog, it's a place to find interviews with creators, and one day it will be a brick and mortar place, too. You'll find new offerings, but the focus of Blastoff is treasures of the past and nostalgia. Scott Tipton describes it best here. Each month is themed, and this month it's all about Daredevil. As you can see from the above photo, I've spent a lot of time with the Man Without Fear so far this month. I'll be tossing up posts related to the theme every week at Blastoff, and I'll also be interviewing some of your favorite creators. Just last weekend I talked to Mark Waid about his current Daredevil run (that video should be up soon). You'll also find posts about comic book history, selling comics, art, and so much more. I think it will be worth your time to follow along and if you're a collector, you'll want to check out Blastoff's online store. Once Upon a Time: Desperate Souls review - Rumpelstiltskin's backstory takes center stage in last Sunday's OUaT! When Cosplay Collides With Cuteness - Brighten your day by looking at cute babies, kids, and animals in costume. I want to hashtag the whole article #happiness. Archaia has been afforded some rather spectacular opportunities because of their relationship with The Jim Henson Company, and they’ve knocked every one of them out of the park. Anthologies like Fraggle Rock and The Storyteller have captured the essence of each franchise while also adding to them. Tale of Sand is a different beast though. Rather than collected stories from a variety of writers and artists, it’s a graphic novel translation of a lost screenplay by Jim Henson and Jerry Juhl (head writer on The Muppets). The feature length screenplay was written before Sesame Street and Muppets and represents other facets of Henson’s creative talents. The screenplay isn’t interpreted in the way you’d expect. In fact, it’s best if you don’t open the book with any expectations. If you flip through the book first (which I did because I was hungry to see the art), you’ll notice the lack of word balloons. This a story that unfolds in images more so than words and oh, what images. Artist Ramón Pérez has brought Henson and Juhl’s work to vivid life. He tells the story of a man who is sent off to the desert on an apparent race. He doesn’t know why he’s there, only that he has a ten minute head start. He dashes off into the desert and soon he finds himself being pursued. He walks from empty, parched vistas into wacky situations like a football game. Part of the joy of this book is experiencing the race, and it’s most effective if the bizarre twists hit you by surprise page after page. I won’t tell you what happens or what he runs into or much else at all about the actual story because I don’t want to rob you of potential reactions. 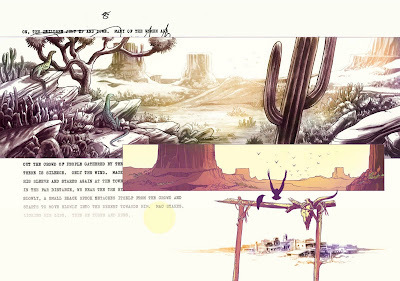 Pérez makes the sandy landscape leap off the page. You feel immersed. You feel there. Though the screenplay is incorporated into the tale in the background and in actual in-panel words (in a font based on Henson’s handwriting), the interpretation landed squarely on Pérez’s shoulders. He made it work, and he did so with such style. Given the nature of the screenplay and the fact that it wasn’t a standard narrative, it could have easily turned into a jumbled wreck. It walks the tight rope. The character design, the palette, the layout, the way the story flows smoothly from one panel to the next – not a beat is missed. Just please don’t open this book expecting cute puppets. Go in with an open mind and drink up the art. Tale of Sand is ambitious, surreal, and glorious. I think it’s also important to note how the book looks. Archaia always publishes high quality books, but this one raises the bar. It’s apparent every decision was made with care. The cover, the type of paper, the print quality – all top notch. It even comes with an elastic band (moleskine notebook style) to mark your place. Sure, they’re small touches but together they make a statement. Presentation is important, and in this case it would make me pick up this book even if I knew nothing about Archaia or Jim Henson. 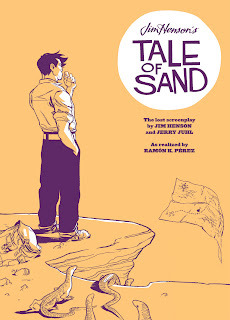 In sum, Tale of Sand is the sexiest graphic novel of 2011. If you aren’t familiar with Henson’s work outside of The Muppets (like Time Piece), you owe it to yourself to see a different side of his genius – this graphic novel exhibits it perfectly. 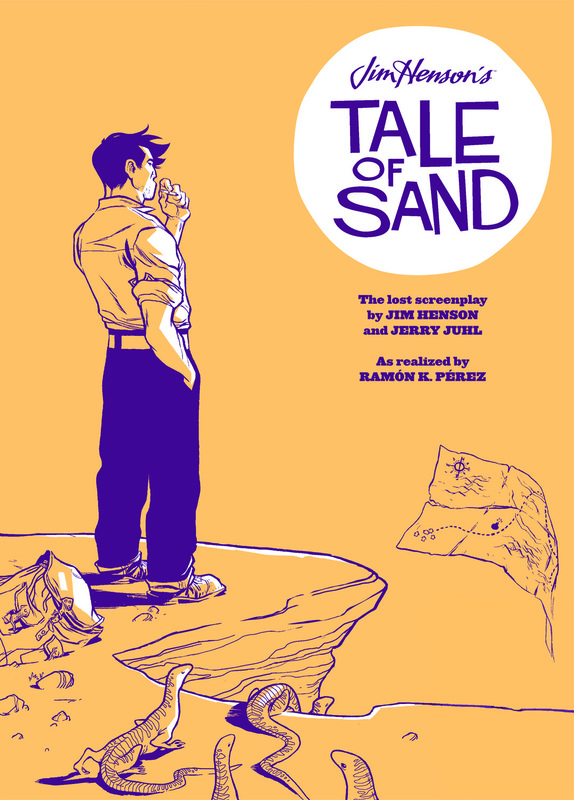 Pre-order Tale of Sand on Amazon or ask about it at your local comic shop! Over one hundred ladies in a snowball fight for charity! You know we live in a good world when comic creators become the heroes. 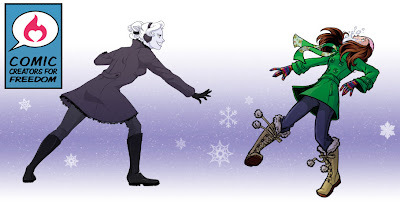 Lora Innes, creator/writer/artist of The Dreamer, may not wear a cape (or maybe she does?!) but she's performing heroic efforts. She's gathered the talents of over 127 artists to raise funds to fight human trafficking. She started Comic Creators for Freedom three years ago, and so far the annual drive has raised over $15,000 for the cause. The statistics are terrifying. It's not just an issue that happens off in the dark corners of Third World countries. Hardly. It's a problem right here in the shiny United States. When Innes became aware of the horrors happening in her own city, she felt compelled to do something to help. Here's how it works: comic artists collaborate to create an original image available in digital and print formats. Every artist contributes a drawing of his or her own, original female character, and each year has a different theme. This time it's an epic snowball fight. If you donate during the fundraising drive, you get a digital download of the complete image. With so many talented creators and such a wide variety of characters, it's sure to be awesome. Donations received will be split evenly between Love 146 and Grace Haven House. Let's see how high we can push the total in 2012. The drive starts today and goes through January 20, and National Human Trafficking Awareness Day is January 11. Keep in mind that even if you can't donate, you can spread the word! Visit the site for more info. Since I've last posted a list of my writings around the web, a few things have changed. I've taken on a couple of new writing gigs and let go of others. I'm consistently contributing to Nerd Approved, Fashionably Geek, IGN, and getting back on track with a monthly Geek Fab column at Pink Raygun. 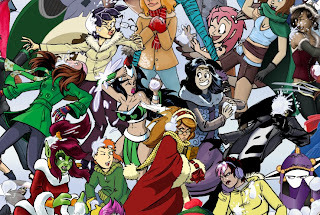 Geek Girls Network has sadly been put on pause for now, but when that site's back up, I'll be there. I've also started contributing to Blastoff Comics (more about that soon) and GeekChicLA. Who knows what will be next. I'm going to attempt getting back in the habit of posting links to my stuff here on a weekly basis. I think I'll be successful. This week I'm also throwing in some older stuff since I haven't posted these in a while. 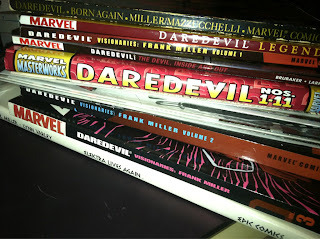 The Devil I Didn't Know - It's Daredevil month at Blastoff Comics, and I'm catching up on a pile of stories and getting to know Matt Murdock. Your Guide to Geeky Travel Destinations - My list of travel destinations to make any geek happy. LEGO Makes "Friends" Line for Girls - Yeah, I had some opinions about LEGO's new line. Battle Los Angeles - Game you like mean it at these tabletop gaming hotspots! You'll see new posts here a couple times a week plus this round-up. Because I'm crazy I also have three little Tumblrs. I wanted a place to put some of my favorite things and quotes: purple lightsaber (Star Wars), games of all the thrones (A Song of Ice and Fire), and all about the words (my favorite quotes). On the way home last night, I ended up at a tattoo parlor (the same one that did my Rebel Alliance tattoo). I left with fresh ink. It all sounds very impulsive, but I've had this in the back of my head for a while. I asked @CapSteveRogers to design this for me back in the fall. It's just how tattoos have worked for me. I know what I want, I might take a while to think about placement, and then one day I will decide it must be put on my skin and done immediately. That's been the case for four of my five tattoos anyways. 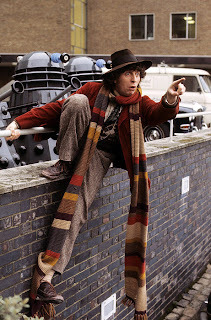 Why "allons-y?" It's a great motto for life and one I've particularly embraced in the past year. 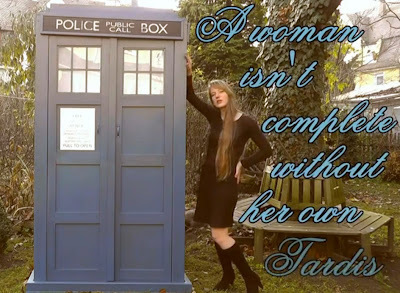 And of course I learned the phrase from the Tenth Doctor. 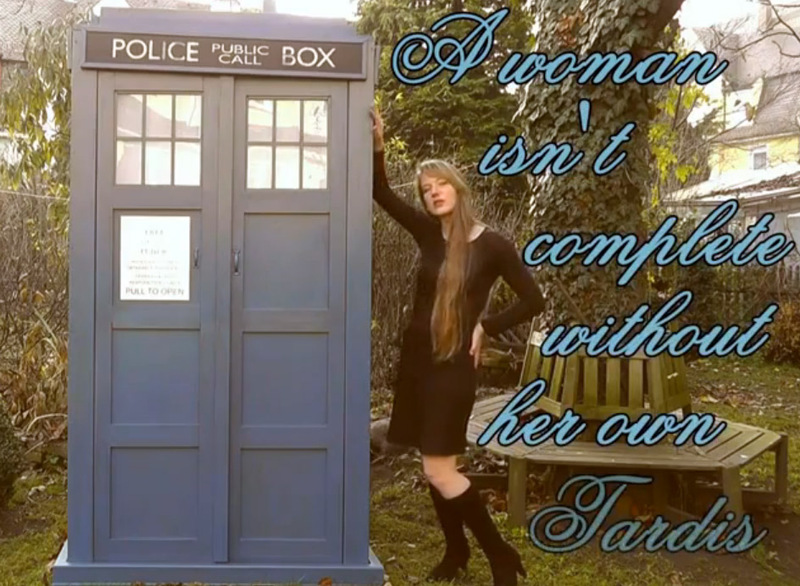 It had to be in the closest shade possible of TARDIS blue. I'm in love with it. If you're curious, two of my other tattoos are geek related. I have the Star Wars tattoo on my left shoulder, and I have the priestess crescent moon symbol from Mists of Avalon on my left hip. And of course, there's a Skywalker in each scene. However, if you're counting, R2-D2 is in five of the final images and Luke is only in four. 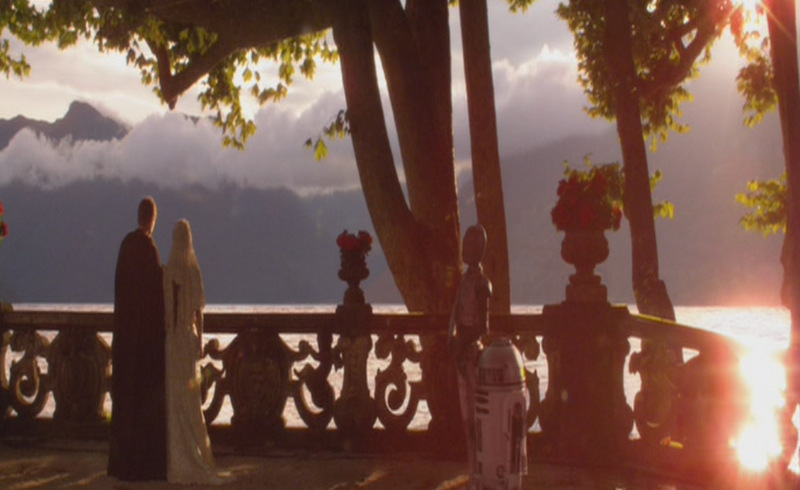 I think that means R2-D2 is actually the most important part of the story, right? Right. For final frames besides those in Star Wars, check out this article at Blastr.